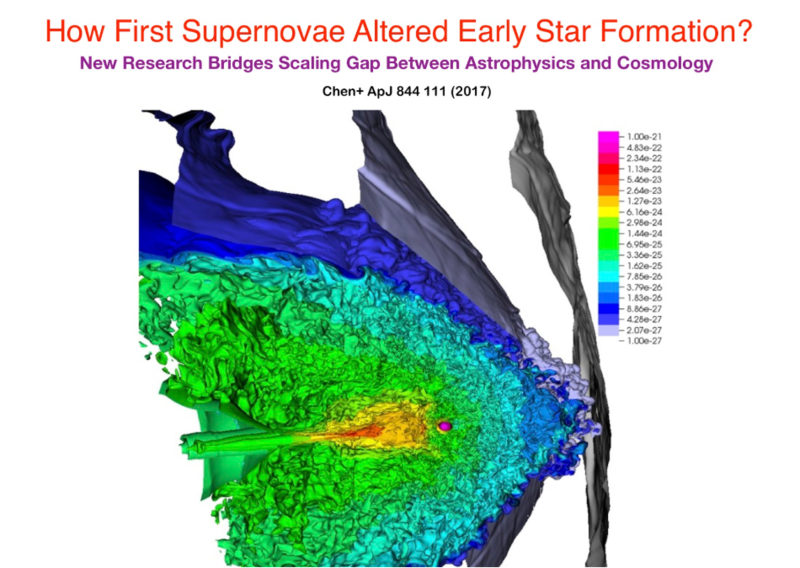 How First Supernovae Altered Early Star Formation? In our respective efforts to understand the universe and all it comprises, there is a telling gap between what cosmologists and astrophysicists study and how they study it: scale. Cosmologists typically focus on the large-scale properties of the universe as a whole, such as galaxies and intergalactic medium; while astrophysicists are more interested in testing physical theories of small- to medium-sized objects, such as stars, supernovae and interstellar medium. And yet the two fields are more closely aligned than it might seem at first glance, especially when looking at how the early universe was formed. Those first stars were very massive, and the supernovae that came from these first stars were also the source of most of the heavy elements in the periodic table. For cosmologists, these metals are very important because they provided cooling and changed the mass scale of the star formation, which also determined the appearance of galaxies later. We are the first group to examine how the first supernovae influenced star formation and, along with it, the evolution of the universe with high-resolution cosmological simulations. The image below shows the turbulent gas when a supernova collides with a nearby star-forming halo (Chen et al. 2017).